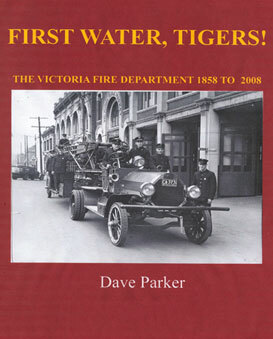 The Victoria Fire Department Historical Society was created in the early 1990s, as a component of the VFD, to preserve the more than 150 year history of the Victoria Fire Department. 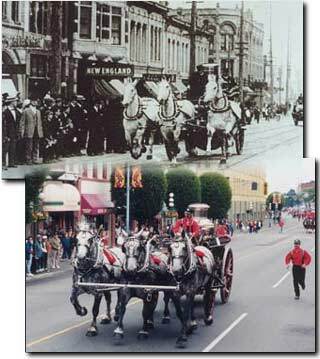 Officially a component of the Department, the Historical Society membership includes both serving and retired Victoria firefighters as well as interested members of the community. We are, in a very real sense, a product of the successful restoration of the Department’s 1899 steam pumper, the “Charles E. Redfern” to full operation. A large and varied collection of photographs, documents, artifacts, and fire apparatus was collected over this period and responsibility for its care rests with the Society. It is a valuable historic resource for Victoria history as well. 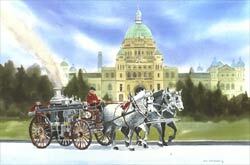 The Victoria Fire Department Historical Society is a community-based organization and we spend much of our efforts on educational activities. We operate a small museum situated in a special section at No.2 Hall, Michigan Street. The display incorporates two dimensional material and artifacts which illustrate the history of the VFD and the development of fire fighting technology generally. School groups, tourists and members of the community have visited the exhibit. (lower) Restored Steam pumper Charles E. Redfern in the same location, July 1999. “Charles E. Redfern” Waterous Fire Engine. Original watercolour painted by Cim MacDonald, Chemainus BC, is available for purchase as a framed or unframed lithograph (limited edition of 500), a framed art card, or a card/envelope combo. All proceeds go towards funding the continued restoration and maintenance of the society’s preserved apparatus.